Insurance adjusters are trained to settle car accident claims quickly and cost-effectively. Any statement you make to an insurance adjuster at the accident scene or during later inquiries can make a significant impact on your financial recovery. Words can be taken out of context or twisted and later used against you, making it all the more important to heed these tips before discussing your claim. 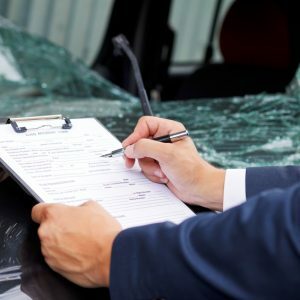 Insurance representatives will ask all parties involved in a car accident to provide a recorded statement, either in writing or through a recorded phone conversation. It is in your best interest to politely decline this request until after you have spoken with an attorney. This recorded statement is considered vital evidence, and any vague or misleading language on your part can later be used against you. Before answering any questions, ask for the name and contact information of the adjuster you are speaking with and confirm the name, address and telephone of the insurance company they work for. Keep a folder with names, dates and details of anyone you speak to at the insurance company. When speaking to an adjuster, you are only required to provide your full name, address, telephone and contact information. It is not advisable to divulge other personal information regarding your employment, your income, or anything about your medical history. Insurance reps will always ask about the car accident injuries you sustained. The best answer is “I don’t know the full extent yet.” Some injuries like concussions and whiplash have no immediate symptoms, and you could unintentionally leave out critical information that will negatively affect your claim for damages. Keep the conversation short and sweet when discussing the accident. Insurance adjusters will press for more details or ask your opinion, but it’s best to remain subjective. When and where the crash occurred, who was involved and if there were any witnesses. Be straightforward and honest. If you don’t know an answer to a question or don’t remember, just say so. Try and write down as much as you can about your conversations with insurance companies. This includes questions that were asked of you, requests made, information provided and the name of the person you spoke with. These notes may contain valuable information that can advance your claim. Insurance representatives may try and get you to settle within the first couple of phone calls. Avoid this trap and wait until you know the full extent of your injuries and have a proper medical diagnosis. With competent legal representation, you stand a much greater chance of securing a larger car accident settlement that fully accounts for your losses. Need help dealing with an insurance adjuster? A skilled Los Angeles car accident lawyer can protect your best interests after a collision. The Salamati Law Firm offers tenacious, results-oriented representation to car crash victims throughout Southern California. We provide sound legal guidance and know how to negotiate with insurance companies to maximize accident compensation. Request a free case evaluation today by calling 1-855-449-3546. « Who Is Liable for Slip and Fall Injuries in Hospitals in California?